In a large bowl, combine the crab, peppers, onions and olives. Combine the lemon juice, vinegar, olive oil and garlic in a food processor. Process until the garlic is completely minced. Add the vinaigrette and cilantro to the crab and vegetables. Combine until well incorporated. Season with salt and pepper to taste. Store the salpicón in the refrigerator until ready to serve. Serve over fresh lettuce leaves, if you wish. You may substitute shrimp for the crab. If you like your food spicy, add a little Tabasco sauce to the vinaigrette. Salpicón (salad mixture) is a common dish in many Latin American countries and you can find different variations of it. One of the most popular is salpicón de mariscos, which takes different kinds of seafood and is really delicious! Today, I am sharing my salpicón de cangrejo (crab meat salad) recipe, which is my favorite because you can use either natural crab or imitation crab meat which is a little less expensive. 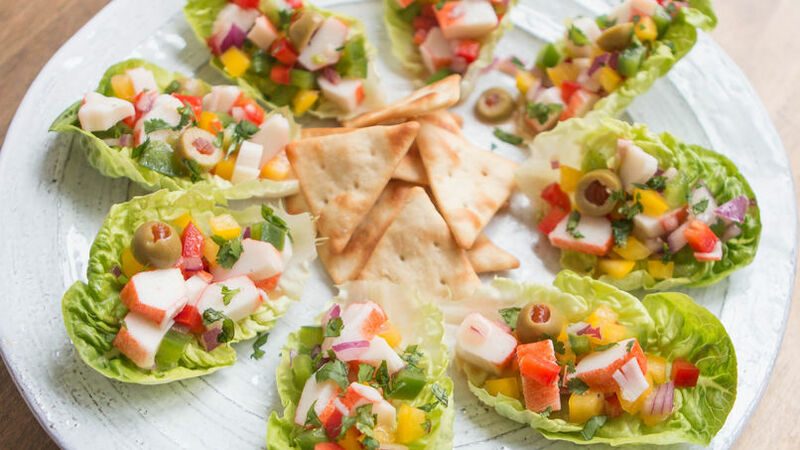 It’s very easy to make and you can serve it as a light lunch or as a party appetizer.